Shorty George Snowden was the top dancer in the Savoy Ballroom from its opening in 1927 into the early 30's, when he formed the first professional Lindy Hop troupe, the Shorty Snowden Dancers. They performed with the Paul Whiteman Orchestra at the Paradise Club downtown through most of the thirties. Although he was barely five feet tall, Snowden made his height an asset rather than a liability. With comic genius, he parodied himself in his signature "Shorty George" step, in which his bent his knees, swinging from side to side, exaggerating his closeness to the ground. Shorty's partner, Big Bea, towered over him. They often ended their routines in a comic move in which she carried him off the dance floor on her back. 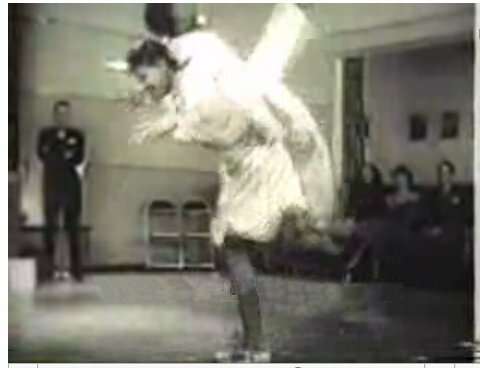 Frankie Manning says that this move inspired him to create his first air step, in which his partner started out on his back and then she flipped over his head and landed on the ground. Ironically, Shorty was defeated by Manning in a major competition when Manning introducted this first air step in 1935. Manning replaced Snowden as reigning king of the Savoy. Manning remembers his first idol and sometime competitor at the Savoy this way: "Shorty was a great comic dancer who knew his art well, like Jack Benny on violin and Victor Borge on piano.He brought comical moves to Lindy Hop and intricacies of footwork." Snowden is often given credit for giving Lindy Hop its name. As the story goes, there was a charity dance-marathon in New York City in 1928, shortly after Charles Lindbergh's (known as "Lucky Lindy") triumphant "hop" across the Atlantic. A reporter saw Snowden break away from his partner and improvise a few steps in a style that was popular in Harlem. "What was that!?" he asked. Snowden thought for a few seconds and replied, "I'm doin' the Hop...the Lindy Hop". The name stuck. 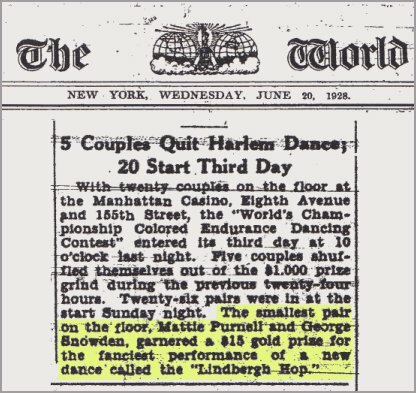 In recent years some writers have challenged the authenticity of the popular story about Short George naming the Lindy Hop. When asked about this, Frankie Manning has said, "All I can say is that I heard the story from Shorty George himself. The other fellas from that time were standing around listening and they didn't say 'Aw, come on Shorty, quit the BS' --- which they would have said if it wasn't true." Written by Judy Pritchett with Frank Manning. Copyright,1995-2006. May not be reproduced without written permission.<judyp@mcn.org>.